When you are renovating your home, trust Flaherty’s Flooring America to provide you with all the flooring options you need. Our luxury vinyl flooring in The Woodlands, TX, is a particularly popular option, thanks to its superior resilience and a large variety of patterns and colors. No matter what area of your home you are refreshing, the luxury vinyl surface is always an excellent choice for your floors. Do you want to add the timeless look of wood to your home, but don’t want to worry about the high-maintenance of hardwood? 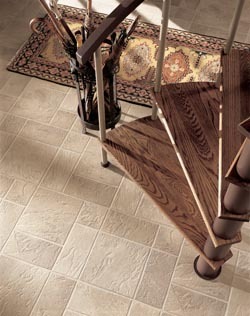 Or, do you want the majestic appearance of Natural stone but don’t want the hard feeling of these tiles underfoot? Well with luxury vinyl tiles or planks, you can have either of these aesthetics. Vinyl tiles are designed to accurately mimic the look of stone or ceramic while providing a softer surface for walking on. This allows you to add the magnificent appearance of stone to living rooms while still being able to comfortably walk around on a softer surface. For the wood-look, luxury vinyl planks are the right way to go. These planks give an accurate appearance of natural hardwoods while providing a surface that is more resilient and easier to maintain. Any messes on your luxury vinyl plank flooring will easily wipe away, leaving your floor looking pristine without the need for polishes or waxes. With a busy home, you need a flooring solution that will stand up to your hectic lifestyle. Thankfully, a luxury vinyl surface is the perfect solution. Designed for real life, vinyl floors will maintain their beautiful appearance for years after they are installed. Vinyl is hard to stain and messes wipe away quickly and easily. Additionally, this resilient flooring is water resistant, meaning there is no risk of your floor warping when it gets wet. This moisture resistance also means that there is less risk of mold or mildew forming under your floor. This helps to protect the health of your family from dangerous mold issues. After choosing the right luxury vinyl solution for your home, let our team take care of the installation. Our professional flooring installers have years of experience installing all types of flooring and will ensure that your new luxury vinyl tile installation is taken care of correctly. With our help, you will know that your new floor looks as good in your home as it did in our showroom and that it will last for many years. Contact us when you are looking for a resilient and beautiful flooring solution for your home. We proudly serve The Woodlands, TX, as well as the Houston area, including Spring, Conroe, Montgomery, Willis, Magnolia, and the surrounding areas.